A rally in St. Ignace on July 14 draws attention to the risks of ruptures and leaks when transporting fossil fuels through the Great Lakes. Calgary-based Enbridge Inc. — the largest shipper of Canadian crude oil — built and operates the twin, 50-centimeter-diameter steel pipelines, about 300 meters apart, that cross the Straits of Mackinac in northern Michigan. 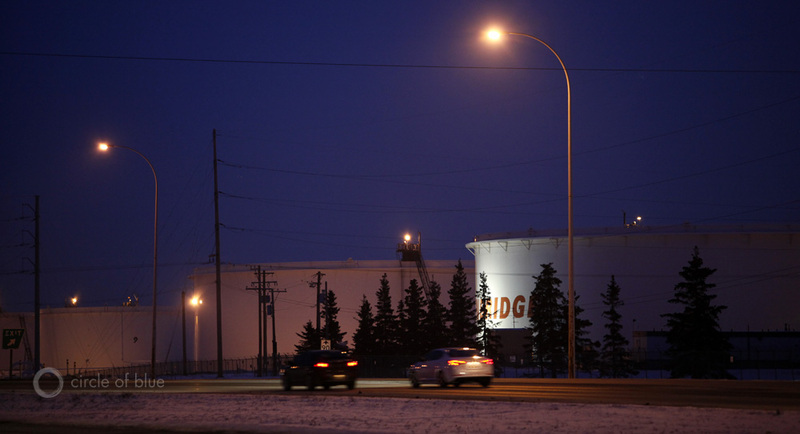 The company’s holdings include this tank farm in Edmonton, Alberta. Click image to enlarge. 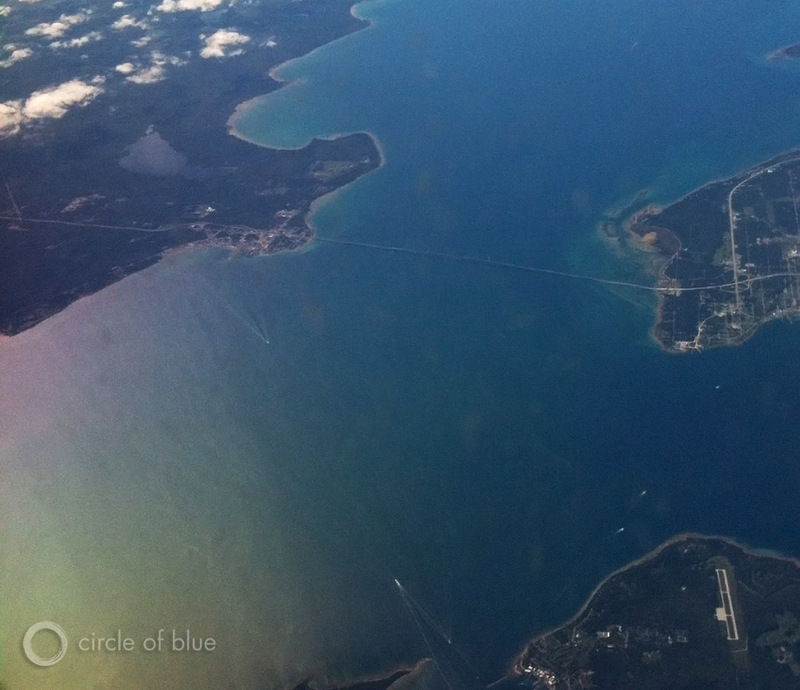 TRAVERSE CITY, Michigan — The Straits of Mackinac, which separate Michigan’s Upper and Lower Peninsulas, are the site of one of the most famous water crossings in the United States — the eight-kilometer-long (five-mile-long) Mackinac Bridge, which opened in 1957. But four years before, in 1953, Enbridge Inc., the Canadian energy transport company, installed two 50-centimeter (20-inch) steel pipelines across the Straits to ship oil and natural gas liquids to refineries and processing plants in Sarnia, Ontario. According to company and federal records, the dual lines — submerged by 36 meters (120 feet) of water and overshadowed by the magnificent bridge that lays alongside — have operated for 60 years without incident and almost no public attention. Define the potential risks of a leak or rupture to the Great Lakes, the largest body of clean surface fresh water in North America. Clarify the role that Enbridge and its customers are playing in expanding the transportation and processing of a gusher of oil and natural gas, under development on the American and Canadian Great Plains, and from the tar sands of Alberta, Canada. Other speakers include Beth Wallace of the National Wildlife Federation, Jeff Spoelstra from the Kalamazoo River Watershed Council, Our Living Great Lakes author Jerry Dennis, Stephen Boyle and Jarret Schlaff of the Detroit Coalition Against Tar Sands, and Bill Latka from TC350. Regional musicians from the Michigan record label, Earthwork Music, will play short sets in between speakers, including Seth & May and the aptly named Lake Effect. Buses will transport attendees from Michigan and Wisconsin cities — including Traverse City, Grand Rapids, Ann Arbor, and Green Bay — to the event, while MLUI’s Rideshare aims to connect carpoolers. Larry Springer, a spokesman for Calgary-based Enbridge, said his company is as concerned as Great Lakes regional residents about safety and has operated Line 5, which crosses the Straits, with the highest standards of oversight, inspection, and operating practices. Line 5, he said in an interview with Circle of Blue, transports lighter oils and natural gas liquids, mostly produced from the Bakken oil and gas fields of North Dakota and Saskatchewan. The company, said Springer, expanded the line’s capacity earlier this year to meet rising demand from refiners. The work, which involved improving pumps, is part of Enbridge’s plan to spend $US 4.35 billion by 2016 to expand the Lakehead pipeline system’s capacity by 2.2 million barrels per day, according to company reports. Enbridge, Springer said, has no intention of using Line 5 — which crosses the Upper Peninsula and much of the northern Lower Peninsula — to transport the heavy oil produced from the tar sands of northern Alberta, Canada. That oil moves through the company’s Line 6, which ruptured in southern Michigan in July 2010, causing the largest inland oil spill in U.S. history. Enbridge has spent $US 1 billion to clear the heavy and sticky oil from the soil and sediments of the Kalamazoo River and its tributaries downstream from Marshall, Mich., in a project that has not yet been completed. Liquid Fuels Transport and Refining in the Great Lakes. 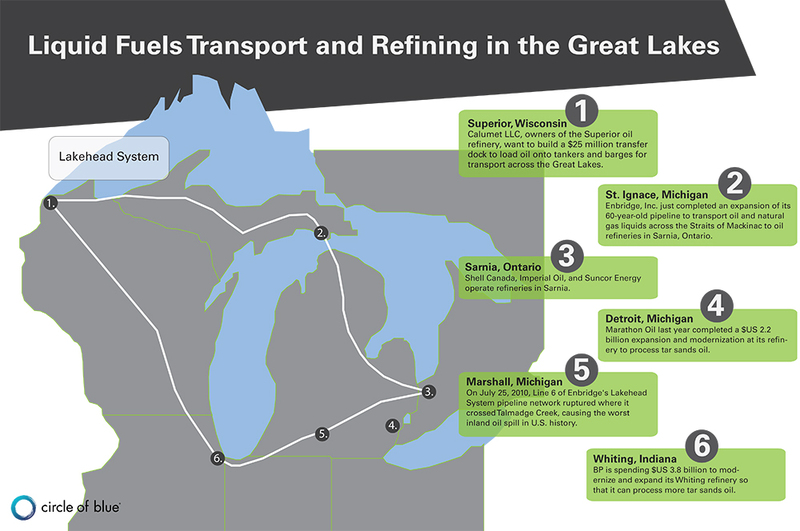 Click to enlarge, or download a PDF of the Liquid Fuels Transport and Refining in the Great Lakes. The St. Ignace rally comes amid a sharp increase in public attention in the United States to a continental boom in oil and natural gas production, its consequences for the economy and the environment, and its potential to raise or reduce emissions of climate-changing gases. Among the important intellectual and activist leaders in spurring the new attention is Bill McKibben, an author, one of the co-founders of 350.org, and a Schumann Distinguished Scholar at Middlebury College in Vermont. McKibben is the keynote speaker at Sunday’s Oil and Water Don’t Mix rally. McKibben and the rally’s organizers are especially concerned about the production and transport of heavy oil that is produced from the tar sands of Alberta. The oil, in the form of bitumen, is so thick it must be diluted with chemicals to make it sufficiently liquid to move through a pipe. There is disagreement about whether the diluted bitumen is more corrosive and dangerous to transport by pipe than conventional crude oil. The Straits of Mackinac, which separate Michigan’s Upper and Lower Peninsula, are the site of one of the most famous water crossings in the United States — the eight-kilometer-long Mackinac Bridge, which opened in 1957. But four years before, in 1953, Enbridge Inc., the Canadian energy-transport company, installed two 50-centimeter steel pipelines across the Straits to ship oil and natural gas liquids to refineries and processing plants in Sarnia, Ontario, and to southeast Michigan. Click image to enlarge. As oil production increases in Canada and the Western United States, pipeline companies are responding with massive expansions of pipeline systems across the continent. They include the Lakehead system and the Keystone XL pipeline, which aims to transport tar sands oil to refineries along the Gulf Coast. The Obama administration is considering whether or not to issue a permit to build Keystone XL. Oil refineries in the Great Lakes region are also expanding to accommodate the new oil supply. The owners of a refinery in Superior, Wis., have even proposed shipping crude oil across the Great Lakes via barge as early as 2015. Enbridge, the largest shipper of Canadian crude oil, built and operates the twin, 51-centimeter-diameter (20-inch-diameter) steel pipelines, about 305 meters (1,000 feet) apart, that cross the Straits of Mackinac. The twin lines can carry approximately 541,000 barrels per day, following a 50,000-barrel-per-day capacity expansion that was completed earlier this year. The two 51-centimeter (20-inch) pipelines are links in the 1,038-kilometer (645-mile) long Line 5 that starts at Superior, Wis., and terminates at Sarnia, Ontario. But in Michigan, skepticism about the company’s operating practices abound. Enbridge pipelines have chalked up 804 spills since 1999, according to a report by the Ottawa-based Polaris Institute that drew on the company’s own records. But the company notes it is required to report even minor spills and leaks, which account for nearly all of those noted in the Polaris report, and Enbridge insists that Line 5 is safe. Critics of the pipelines point to the company’s spill record as evidence that these measures are not enough. Jim Lively of the Michigan Land Use Institute cites the ages of the Straits pipeline and the one that ruptured in southern Michigan as reasons to be vigilant. “This is what they said about Kalamazoo, and those pipelines were also 60 years old,” Lively said. Colin Smith and Laura Stegmeyer, undergraduate students at Kalamazoo College and Grand Valley State University, respectively, are interning on the Circle of Blue news desk this summer. I would just like to comment on the infographic you have included. After Enbridge took heat earlier this year from environmental groups for not including islands in an image as part of their Northern Gateway advertisement campaign, you guys have turned around and made this image which clearly over emphasizes the size of the Straights of Mackinac. In my opinion this is an equivalent and equally unacceptable gesture. Luckily for you this image wont receive the same scrutiny as Enbridge’s image, however it is still fundamentally wrong.